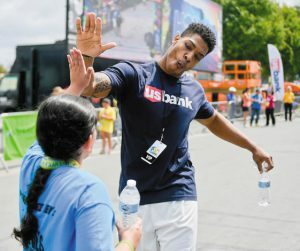 A scene from the U.S. Bank road tour. The Giving USA Report released in June reports that donations to charities and nonprofits are up 4 percent from 2014, growing at a rate of more than $1 billion a day (totaling an estimated $373.25 billion in 2015). At the same time, a survey from U.S. Bank finds that only 31 percent of Americans have volunteered their time thus far in 2016. The most common reason people don’t volunteer is because they don’t want to do it alone (42 percent) or they don’t know how to get involved (39 percent). About a third of the respondents, alternatively, said they would rather donate money than time. Confronted with this data and the desire to motivate their 67,000 employees across a 25-state footprint, Minneapolis-based U.S. Bank thought: “road trip.” Beginning with the Orange County Marathon in early May, the $425-billion asset bank embarked on a three-month, 12,000-mile Community Possible Relay. 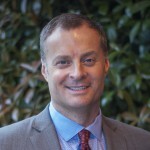 The campaign includes volunteer activities centered around work, home and play—the focus areas of the bank’s new Community Possible corporate giving program. 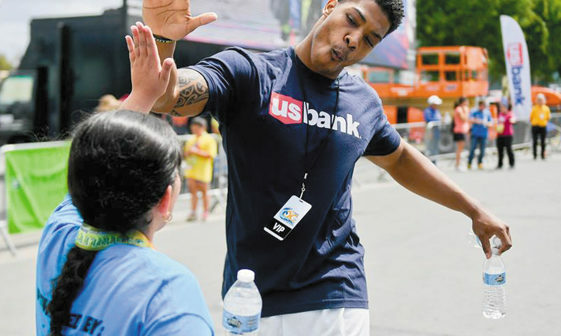 A scene from the U.S. Bank relay. Pacific Continental Bank’s Giving with Heart program is overseen by an employee-based committee that identifies opportunities for volunteerism and cash gifts, and serves as a resource for employees who want to get involved in their community. The bank was one of the first businesses in Eugene, Ore., to develop a formal program that allows employees paid time off to volunteer (up to 40 hours per year) and matches monetary donations (up to $500 per year). More than 250 nonprofits throughout the Pacific Northwest that focus on areas such as youth services, education, family and health, community arts, economic development, animal welfare and sustainability have benefitted from their contributions. Inland Bank and Trust, a $1 billion-asset bank based in Oak Brook, Ill., wanted to help those on the journey to beat cancer. Inspired by a Super Bowl ad created by Chevrolet showing how the company assists cancer patients and their families, chairman and CEO Howard Jaffe met with the American Cancer Society to discuss ways bankers could contribute beyond monetary donations. He learned they were in desperate need of drivers to get patients to their appointments, particularly during the work day. That led to the bank’s Purple Roads program, which provides time off and mileage reimbursement to employees who participate. The more than 40 volunteers from the bank ensure patients are able to get to their appointments, and the drivers provide a little cheer and good will along the way. Since the Purple Roads Program’s inception, the bank has been able to provide hundreds of rides for cancer patients in the counties that the bank serves. The ABA Foundation awarded its 2015 ABA Community Commitment Award in the volunteerism category to Inland Bank as a result of the project. While monetary donations are vitally important, these banks demonstrate that volunteering embodies the essence of giving by making contributions that help both individuals and the community at large.